INGENASA is a SME Biotechnology company dedicated to the research, development and marketing of products designed for the diagnosis and prevention of infectious diseases, especially those affecting the Animal Health sector. 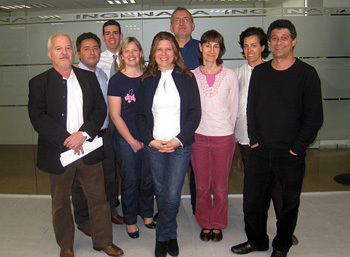 The company with base in Madrid has 43 employees, mostly women, and has more than 25 years of experience in the field. The research activities (50% of the total sales) are partially funded by national grants from the Spanish Governmental Agencies and from European Union Framework Programmes. The facilities of INGENASA are located on two floors from adjoining buildings, with a total area of 2000 m2. All the activities performed in these facilities have the specific permission required. The company is ISO 9001 and ISO 14001certify. The Friedrich-Loeffler-Institut (FLI), Federal Research Institute for Animal Health, is an independent federal authority under the auspices of the Federal Ministry for Consumer Protection, Nutrition and Agriculture in Germany (BMELV). Its task is to produce the scientific basis to help decision making in the areas of nutrition, agriculture and forestry, and to expand scientific knowledge in these areas. The FLI performs research concerning infectious animal diseases and related sciences. High containment animal facilities and laboratories allow working with pathogens up to BSL3+ both in vivo and in vitro. The FLI hosts the National Reference Laboratories for several notifiable diseases including foot-and-mouth disease, swine vesicular disease, bluetongue, and African and classical swine fever within the Institute of Diagnostic Virology. Targeted research is performed on diagnostic test development, validation, and optimization. The Swiss headquartered biotechnology company Prionics AG (www.prionics.com) was founded in 1997 as a spin-off from the University of Zurich.Prionics is certified in accordance with ISO 9001:2000 and ISO/IEC 17025. The Regional Organization of Prionics AG is made up of five 100% owned affiliates that serve as regional hubs and selected distribution partners around the world. Prionics operates a 600 square meter biosafety laboratory in Zurich, Switzerland which is one of the largest BL-3 facilities in Europe. This facility, together with the routine diagnostic services, enables Prionics to maintain hands-on experience with a wide range of pathogens. In addition BL-2 and BL-1 facilities are available. Prionics AG operates research, development and production facilities equipped with state-of-the-art capabilities for biochemical, molecular biology, analytical biochemistry and for the development and production of diagnostic test kits. PROPHYL Ltd. is an SME with large-scale industrial poultry farms, as well as Europe’s largest production of SPF eggs. Vaccine eggs and embryos are also produced. By having large industrial production units and supporting field laboratories, this SME is producing poultry and swine products and providing experimental background for human and veterinary medical research. In collaboration, the company has own developments, such as a Goose Hemorrhagic Enteritis vaccine, innovation of immunization methods and takes a determining part in the monitoring and diagnostic work of poultry and swine integration. The company was founded in 1991 and in 2006 became the leader SPF egg supplier in Europe in collaboration with Charles River Laboratories, USA. PROPHYL’s Test Facility is the No. 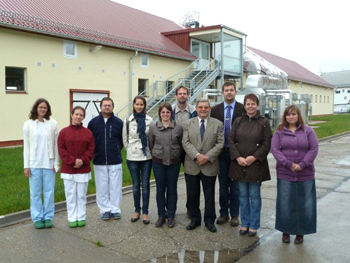 1 GLP and GMP farm in Hungary, which has a certificate to conduct studies in all kinds of domestic animals including cattle and horses. This facility is able to work soon as a BL-3 animal house as well. The base of PROPHYL is in Mohács, Hungary and the SPF and the Test sites and the field laboratories are located nearby. Today a total of 52 persons (veterinarians, biology engineers, agricultural engineers, technical and economy staff) work for the company. The Centro de Astrobiología (INTA-CSIC) is an interdisciplinary centre and the first international partner associated to the NASA Astrobiology Institute. The Centro de Astrobiología (CAB) is the only Astrobiology Center in the world. It is based on the campus of the INTA and depends administratively of INTA and the Consejo Superior de Investigaciones Científicas (CSIC). 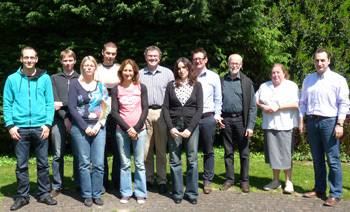 The CAB is a multidisciplinary institution in which researchers from many different fields (physics, astrophysics, astrochemists, computation, mathematics, geologists, paleontologists, chemists, biologists, molecular biologists and engineers) are involved in trying to answer a basic question: is life a consequence of the evolution of the universe? In the road map of Astrobiology, the development of sensors and instrumentation for life detection in planetary exploration is a critical task and occupies an important part of the research performed at CAB. Additionally, it is also very important for CAB to make space science renders spin-off benefits to the society, and the field of biosensor development for environmental, medical, and veterinary purposes is an excellent meeting point. The Pirbright Institute is part of the Biotechnology and Biological Sciences Research Council in the UK and is a global centre for fundamental research and surveillance of exotic viral diseases of livestock. The mission of The Pirbright Institute is to understand the process of infectious diseases and from that knowledge improve the efficacy and sustainability of livestock farming, enhance animal welfare, safeguard the supply and safety of food and protect the environment. The Pirbright Institute provides national and international reference laboratories for diseases such as foot-and-mouth disease, African swine fever, bluetongue, peste des petits ruminants and Marek’s disease. This enables us to monitor the distribution and transmission of new virus strains, to provide early warning of emerging threats and to identify gaps in preparedness and research needs. ANSES (French Agency for Food, Environmental and Occupational Health & Safety) is a state-run safety agency operating twelve laboratories in France and more specifically, two laboratories on the Maisons-Alfort (near Paris) campus, in close cooperation with the ENVA (Alfort National Veterinary School). The two ANSES laboratories, the Animal Health Laboratory (AHL -four Reference and Research Units) and the Food Safety Laboratory (FSL -nine RRUs), hold 22 National Reference Laboratory (NRL) mandates for animal health (from major epizootic diseases, such as FMDV, BTV and AHSV to major zoonoses such as tuberculosis, brucellosis, anthrax, tularaemia, etc.) and food safety (salmonellosis, listeriosis, Staphyloccocus). Following a competitive call, five European Reference Laboratory (EU-RL) mandates were granted, for brucellosis, major equine pathogens, listeriosis, Staphyloccocus and milk safety. ANSES and the ENVA, along with INRA, operate two Joint Research Units (JRU or UMR) dedicated to virus research (UMR virology) and parasitology (UMR-BIPAR) respectively. Moreover, ANSES has also set up IdentyPath, a technological platform dedicated to the development of reliable diagnostic tools for identification, typing and characterization of animal health-related microorganisms and those responsible for food poisoning. The laboratory of Animal Health in Maisons-Alfort has about 80 employees and the Virology unit -JRU of Virology- (headed by S Zientara) has about 40 people. The work is funded by the French Government and by European Union Framework Programmes. The UCM is the biggest, oldest (1494) and most complete University un Spain. UCM has two campus with 20 faculties. 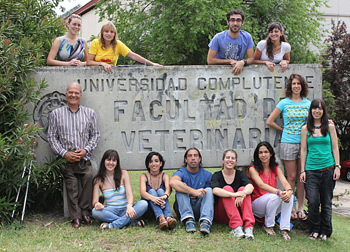 Veterinary Faculty is the main and oldest Veterinary Faculty in Spain, it is home to one of the most important diagnostic units of infectious diseases and veterinary health surveillance center (UCM), as well as animal hospitals. 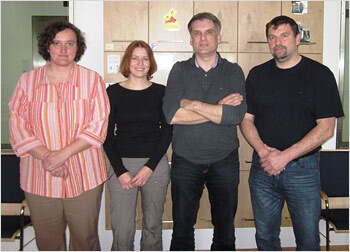 UCM is a team of professionals with over 20 years experience in Animal Health and Food Safety. Currently, the main activities of UCM are related with the development of new diagnostic technologies, vaccines, preventive medicine, eradication models for the control of animal diseases, and immunology and virus studies. UCM has facilities - BSL2 and BSL3 laboratories- for the performance of molecular biology work, clinical assays with animals, viral cultures, cell cultures and immunology techniques. UCM is OIE reference laboratory for African horse sickness and African swine fever, and European Union Reference Laboratory for Bovine Tuberculosis. UCM is the responsible for coordinating the Veterinary Surveillance Network of Resistance to Antibiotics (Red VAV) and the Health Surveillance Program of the Community of Madrid. Furthermore, it provides technical and laboratory support to all National Reference Laboratories and Spanish Veterinary Services. The Veterinary and Agrochemical Research Centre (CODA-CERVA) is a research Centre under the wardship of the Minister of SMCs, Independent workers, Agriculture and Scientific policy, and is administratively connected to the Federal Public Service for Public Health, Food Chain Safety and Environment in Belgium. Its main mission is supporting a safe and sustainable agriculture. The CODA-CERVA employs about 75 researchers, some 105 laboratory technicians and 50 people in support services. The veterinary laboratories are located at Ukkel and host the national reference laboratory for infectious diseases in animals for Belgian and international authorities such as OIE and FAO. The core activities consist of policy supporting scientific research, expert advice, and the efficient provision of services in: epidemic, endemic and emerging transmittable diseases in animals; zoonotic and emerging infectious diseases threatening public health; and epidemiology: surveillance, risk analysis, and molecular epidemiology. The National Veterinary Institute (Statens Veterinärmedicinska Anstalt, SVA) is the main centre in Sweden with the overall responsibility for diagnostic and prophylactic work, as well as research and development in infectious diseases of domestic and wild animals. The aim of the activities is to promote animal health and welfare and to minimize hazards associated with animals important to public health and the environment. Under the supervision of the Ministry of Agriculture, SVA plays a central role in the country both in diagnostic services and also as main partner of eradication programs of infectious diseases. SVA is a Collaborating Centre of the OIE. IDEXX Switzerland AG is an internationally recognised leader in the production animal diagnostic market offering state-of-the-art diagnostic reagents and test kits for the control of diseases. IDEXX Switzerland AG is strongly committed to research and development, manufacturing and marketing of veterinary diagnostics. The company is a business unit of IDEXX Laboratories, Inc., headquartered in Westbrook, Maine, USA. IDEXX Laboratories employs more than 4,800 people and offers products to customers in over 100 countries. Besides the livestock and poultry diagnostic market the company focuses on companion animal health, combining biotechnology, medical device technology and information technology. Employing innovative technologies to monitor safety and quality of drinking water and milk are the main tasks of IDEXX Laboratories’ food and water businesses. IDEXX Switzerland AG is an ISO 9001:2000 approved company. The R&D department is working in compliance with GLP standards and product development processes are included in the ISO 9001:2000 certification. All necessary equipment for working with tissue culture, genetically modified organisms and hybridoma cell lines are in place. The facility harbours research laboratories with biosafety levels 2 and 3**. Production, Quality Control, Finance and International Marketing Department are located in the same facility. In addition, IDEXX Laboratories headquarters are strongly committed to provide assistance with an experienced R&D, Regulatory and Patent Department. Enigma Diagnostics Ltd was founded in 2004 on the basis of technology for the detection of biological agents developed at the UK Ministry of Defence site at Porton Down. Enigma specializes in developing next generation rapid molecular diagnostic instrument platforms for decentralized and point-of-care settings. Enigma currently has 49 employees distributed between sites at Cambridge and Porton Down (UK), and San Diego (USA). Enigma and GlaxoSmithKline (GSK) recently signed agreements for the supply and commercialization of the Enigma ML system for human clinical diagnosis in Europe and other designated key countries. The agreements include development by Enigma of an initial range of respiratory tests for use on its real-time Polymerase Chain Reaction (PCR) technology platform, and provide GSK the opportunity to generate revenues from further test developments in infectious diseases and in other therapeutic areas relevant to its healthcare business.